From her shapely brows and thick black lashes to impeccable accessory selections, she's the perfect depiction of mid-20th-century style. It's not a pin-up calendar or movie magazine cover that draws this comparison, but an elaborately styled "head" vase instead. These distinctive figural vases adored by many "head hunters" today did indeed hold flowers at one point. Florists sold artfully arranged bouquets in these fancy wares. In fact, that's how most of them ended up in American homes during the 1950s, '60s, and early '70s, although a few were produced earlier. There are a number of common head vases available for $50 or less through online auctions and at local flea markets or estate sales, but a handful will sell for hundreds and even $1,000 or more in the right market. Head vases have been reproduced and are widely sold in gift shops around the country. Most of the recent pieces are easy to recognize in comparison to older ceramics. Take care when buying, however, especially if you are an inexperienced collector. One of the vases transitioning from the '40s to the early '50s was the heavier ceramic Glamour Girl vase. Some of these were incised directly in the ceramic material, with the words "Glamour Girl." Others are simply marked U.S.A. on the bases. These distinctive head vases received painted features in various colorways with some decorating jobs being much nicer than others. The demure pin-up girl characteristics and hairstyle on these particular designs give them a definite retro '40s look, although some are attributed to the '50s when offered for sale. While Glamour Girls certainly attract their share of collecting attention, they are fairly low rung when it comes to head vase desirability and value so they're often snagged at bargain prices. Many of the most desirable head vases feature fancy hats, realistic facial features, and even pearl necklaces with matching dangle earrings adorning them. Some even have a shapely hand with painted nails delicately framing one side of the face. These more detailed porcelain models (like those in the illustration above) provide a wide selection for head vase fans to collect. It's been estimated that there are at least 10,000 different varieties available to keep enthusiasts entertained. Some of these go beyond the average to depict high profile celebrities. 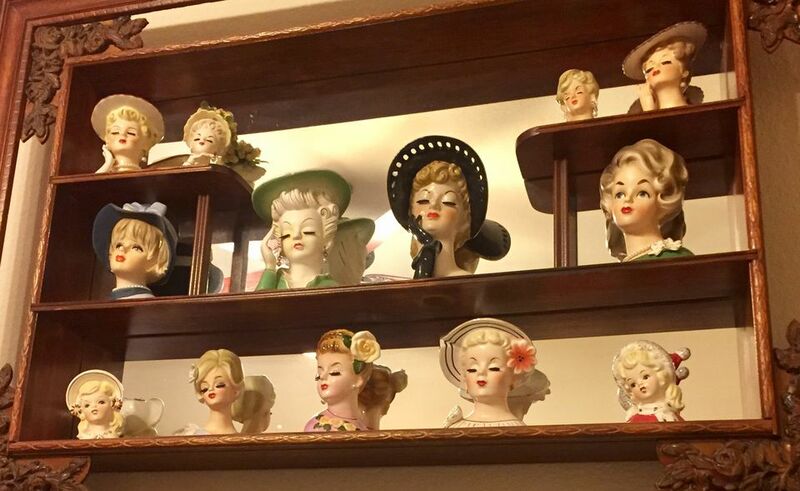 Marilyn Monroe, Lucille Ball, and Jackie O. all had head vases modeled after their likeness. These can be some of the most valuable and are keenly sought by today's head hunters. A Minnesota auction featured in Kovels' newsletter in the early 2000s offered an extensive collection of head vases for sale. A vase bearing Monroe's features sold for $605 in that sale, while a Lucille Ball head dressed as Mame brought $495. Jackie O. vases can be purchased on eBay fairly often in the $150-300 range depending on condition. Prices for these rare examples will always be above average. Most non-celebrity vases sell for far less in many parts of the country. At just about any antique show you'll find a few priced between $30 to 200. These range from mini vases measuring in the two-inch range to grand examples as tall as 14 inches or so. The larger vases usually get a higher ticket price, since they are harder to come by. And some rare examples, like one dubbed by collectors as "I Dream of Jeannie" can sell into the thousands when offered in excellent to mint condition. Vases featuring teenage faces are not quite as plentiful as the adult versions, so some head vase collectors will pay a premium for those as well. It's not uncommon for these fresh-faced versions to sell in the $75 to100 range with certain desirable examples reaching even higher price points. These prices compare starkly to what these containers cost 40 to 60 years ago when they were new. Much like the plentiful green or clear glass florist's vases that turn up at garage sales these days, lady head vases were purchased by professional floral designers in bulk and tapped for everyday special occasion use in days gone by. Most of these shapely vessels were produced in Japan and many have marks stamped on the bottom. Some names collectors look for are Napco or Napcoware, the mark used by National Potteries Company, along with those made by Enesco, Inarco, Lefton, Relpo, Ruebens, and Betty Lou Nichols. There are a handful of other maker's marks and many examples that were unsigned or just marked with a foil sticker that has worn away with use and wears over time. Having a mark doesn't always make a head vase more valuable, especially with very popular designs, but it certainly doesn't hurt anything and always assists in identification. Even some of the celebrity vases can be somewhat hard to recognize without guidance, so taking a look at a book on the topic can definitely come in handy when determining desirability and value. If you would like to learn more about this subject, seek out a copy of The Encyclopedia of Head Vases by Kathleen Cole for Schiffer Publishing.